Since I will most certainly be busy all day going to fashion shows and the fantabulous Evolving Influence Conference, here is another outfit post. I must say I am quite proud of this look, mostly because I started off pretty good: But then had a stroke of genius and decided to wear a vintage headscarf I had yoinked from my mom the night before. My poor mom, I'm always stealing her stuff, it's her fault she's so fabulous! Wendy Brandes may have a signature pose of crossing one leg in front of the other, but mine is some sort of knobby kneed have to pee stance. 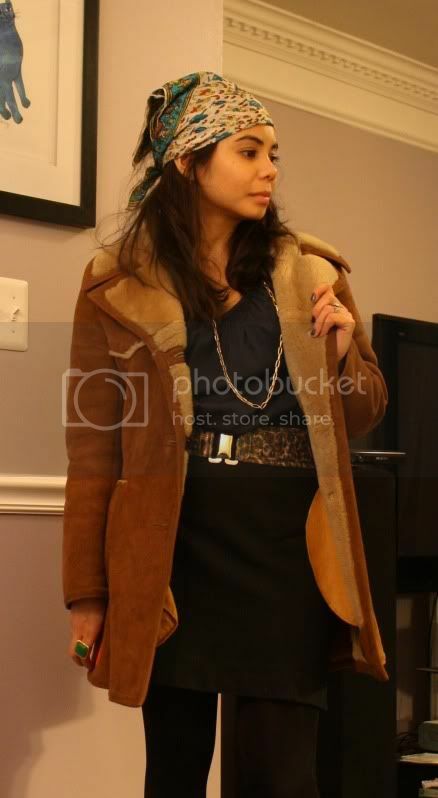 Add in my vintage shearling coat and the look is just complete! See how making yourself add on pieces can result in fabulous results?? More is more, darling! So do you like my look? I feel like I pulled off 70's while looking polished and office appropriate! Aw, you have to do a WendyB pose for my blog!